Medieval theologians and preachers drew on a large number of books in their studies and writings. Often a volume from a cathedral or monastic library would contain works by several authors, bringing together writings that were related in some way. 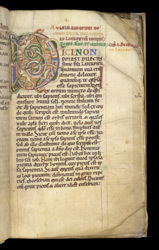 Containing instructive and inspirational writings on worship and faith, this manuscript belonged to the monastery of St Augustine, Canterbury. Each piece was copied by a different scribe on a separate section of pages, and two of them may have been made in the 11th century while the rest were made in the 12th. St Augustine's enchiridion (manual) on hope, faith and love begins on this page, at the splendidly decorated letter. It is definitely a teaching work: Augustine wrote it in response to the query of a student, who wanted a short, portable book on worship. The imaginary animals which inhabit the first letter and its rich colours are typical of the Romanesque style of decoration in 12th-century England.